Lock in a great price for Perun Hotel Sandanski – rated 8.7 by recent guests! The room was clean, the breakfast was good and the SPA center is small but perfect. Our kid liked swimming pool the most. I would highly recommend this hotel. Tha spa center was good, but the room wasn't; it had old and rusty furniture. Friendly staff, clean and warm room, perfect spa, clean pool, yakuzi, decent price. We recommend to everyone even for longer stay then only 2 days. 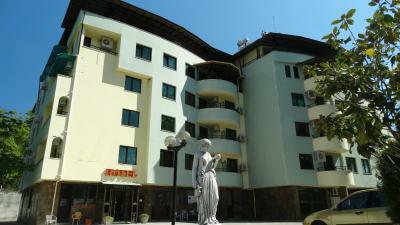 We hope that soon we are going to visit Sandanski and stay at Perun hotel. 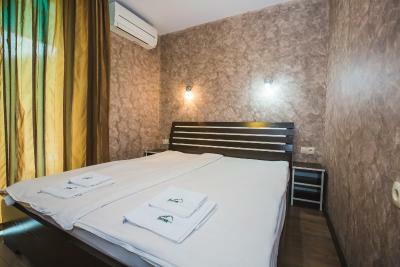 Very clean, spacious room, fast internet, great staff, warm and comfortable room, delicious and full of variatis breakfast. Pricewise -ok, good parking, excellent wi-fi and breakfast pretty much ok. Very good hotel. Location is near a park. Food is very good at the restaurant. Friendly staff. Nice friendly staff. Very good breakfast. Nice restaurant in hotel, where you can pay for lunch, dinner, various menu, bulgarian and int. cuisine. Nice beer Shumensko. Free safe parking. the location, near a beautiful park; the staff (reception, restaurant) is nice; cozy garden with a playground; clean and lovely apartments; TV with a lot of channels; the food in the restaurant is good, big plates and very well priced, the included breakfast is also good (3 kinds of meat, cheese, yellow cheese, youghurt, milk, corn cereals, fresh tomatoes and cucumbers, honey, jam, butter, juices, tea, very good coffee, omlettes, cheese and chocolate croissants). We had breakfast between 8 and 9 am, but only when we were leaving, they brought the croissants and pies. One advice: some fruit? Excellent hotel, comfort rooms, very clean. Good breakfast which is included in price, excellent restaurant with preaty playground for children. Great value for money. 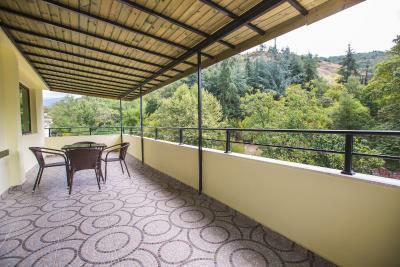 Perun Hotel Sandanski This rating is a reflection of how the property compares to the industry standard when it comes to price, facilities and services available. It's based on a self-evaluation by the property. Use this rating to help choose your stay! One of our best sellers in Sandanski! The new Perun Hotel enjoys a peaceful location next to the large city park on the edge of Sandanski. It offers fine Bulgarian cuisine. 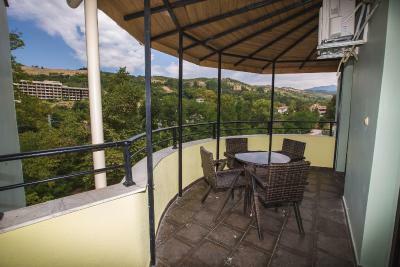 All rooms at the Hotel Perun are air-conditioned and have a balcony offering views of the Pirin Mountains' foothills. Free Wi-Fi is available in all of them. A number of attractions like the city of Melnik, the Rojen Monastery and Samuil's Fortress are less than a half-hour drive away from the Perun Hotel. The restaurant with its charming garden terrace serves a wide range of Bulgarian specialties and international cuisine. The lobby bar is open 24 hours a day. 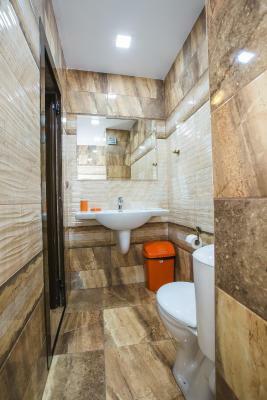 This property is also rated for the best value in Sandanski! Guests are getting more for their money when compared to other properties in this city. When would you like to stay at Perun Hotel Sandanski? Room featuring cable TV, a balcony and a private bathroom with shower. Suite featuring a separate living room with a sofa bed, cable TV, a balcony and a private bathroom with shower. This twin/double room features a seating area, sofa and air conditioning. 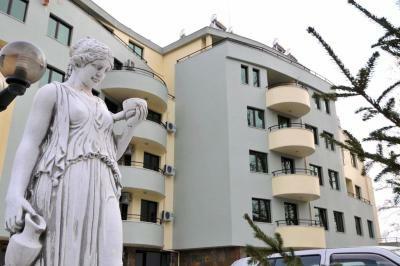 House Rules Perun Hotel Sandanski takes special requests – add in the next step! Perun Hotel Sandanski accepts these cards and reserves the right to temporarily hold an amount prior to arrival. Please note that the SPA center will be under construction from 4 of June until 20 of December. Our main dislike was the carpet in the apartment! It was worn out and in our opinion never washed since it was installed. We were weary of stepping on it without slippers or shoes on. The bathroom was small and theshower cabin’s door kept unhindging. The shower heads had only one shower option, which was painful on the kids skin. The water in the cabin wouldn’t drain fast enough and we had to stand in the middle of a foamy shower basin while taking a shower. The staff was kind and helpful. Our kids loved hanging out at the pull which was the right size for them. The water in the pool was nice and warm. Breakfast was plenty and the restaurant clean and with lots of choices on the menu. We appreciated the proximity of the Sveti Vrach park, which by the way is a great place to relax or spend the entire day if you are with small children. Overall, we had a very good time! The room smelled like cigarettes, even though it stated it was non-smoking. They were doing construction right outside our window everyday starting at 8am. The Spa looked much larger in the pictures due to the mirror lining the wall. The included breakfast was very minimal and the staff didn't even address us at all. They don't state that they have mineral water even though they are located in a popular mineral water area. It was the cheapest in the area, but still quite expensive for what it is. The spa facilities looked clean and sort of new. Warm water at the pool. Very good breakfast. Hot mineral pool, Jacuzi, Hammam, Sauna (all free of charge and the rooms are at the same building with the spa, so you don't have to walk outside at the cold after the sauna). Friendly personnel that knew english. Good breakfast with a wide choice of coffees. Very tasty foods at the restaurant! The room and te restaurant service. Parking with number of rooms. Evreting is nice... I will back next month..
Big size room and reasonable size bed. Bathroom was little small. Staff was very helpful and nice. 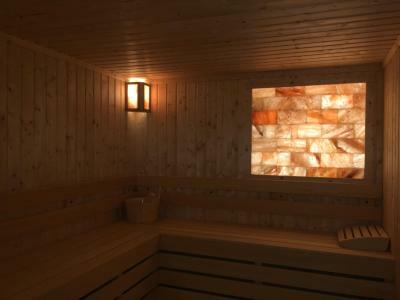 Very nice sauna and steam bath. Small, but warm and pleasant swimming pool. Breakfast was ok for 3* hotel, they topped up plates even before closure time. The spa and other facilities were great!